A favorite amongst cigar connoisseurs dating back to the turn of the 20th Century, Perfecto Garcia are hand rolled premium cigars produced in Nicaragua by highly skilled and specially trained cigar rollers. Each Perfecto Garcia is beautifully rolled and firmly packed, individually hand crafted using an Ecuadorian grown tobacco leaf wrapped around a unique blend of filler tobaccos from Honduras, Nicaragua, and the Dominican Republic. Offered at an excellent value, these premium cigars produce a smooth yet full robust flavor with every smoke. Stock your humidors with these masterpiece premium hand-rolled cigars. 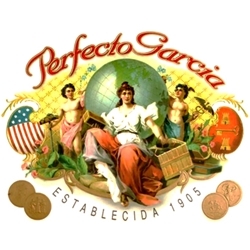 Smokers Discounts believes you'll really enjoy Perfecto Garcia cigars. Relax and unwind with these great smokes at a great price. We’ve made it easy and affordable to buy premium cigars online. A variety of sizes and flavors are listed below in our online cigar store. Each of these styles are in stock and available for a low discount price! Call us for more details!